Colours make us happy and for this reason any Indian festivity is incomplete without a splash of colours. Rangoli marks the beginning of any festival; this is a beautiful art of creating flowers, petals and other designs on a large space. When diyas or oil lamps are placed on the rangoli, a holy aura spreads throughout the space. • Studded with kundans, crystals and beads. Let us checkout some of the most beautiful and popular rangoli designs which you can use at pooja. 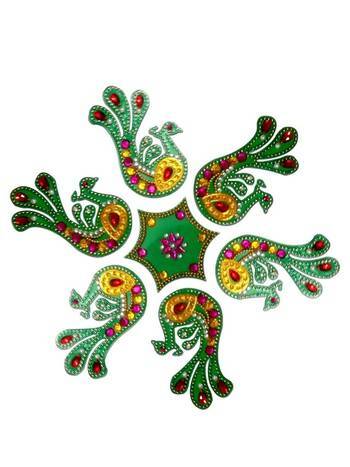 If you are not sure which rangoli design will best suit the occasion, choose a floral rangoli. This is the most traditional rangoli design which can be used at the entrance and also in the pooja ghar. The flora beads create a natural beauty. The best part of Flower shaped rangoli designs is that there are even spaces to place oil lamps. 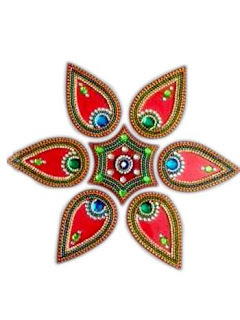 As these rangoli are detachable these can be used to form different designs. These rangoli designs are a breakthrough from the classic festive décor. While it takes hours to create such designs at home, the acrylic based rangoli gives the same grand looks within minutes. The rangoli are made with decorative beads. Rectangular, pentagon, square and circular, you have varied options to choose from. Traditionally, the square shaped rangoli are more famous during Diwali, while the star shaped rangoli can add glamour to any special occasion. Lord Ganesha is an icon of prosperity and good omen. For this reason Indians ensure to keep his image at any form during the festivities. The Ganesha shaped rangoli are available in varied colours which means for all the 11 days of grand Ganesh Chaturthi celebration you can have 11 different rangoli adorning your home or pooja ghar. While some of the rangoli just showcase the face of Lord Ganesha, the others exhibit the complete image in bright colours. This national bird of India is associated with the idea of rainbow of colours. 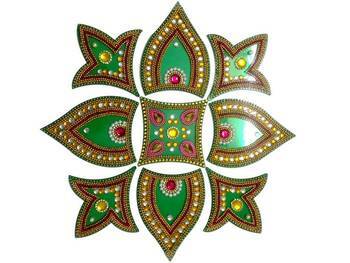 This is a popular rangoli type made on acrylic. Peacock rangoli design is studded with kundans. You can use peacock feathers or Mor Pankh to enhance the beauty of this rangoli. So let this occasion be a season of colours with the vibrance of peacock rangoli spread throughout the floor. These readymade rangoli designs are available in varied shapes and sizes. So whether the pooja ghar is small or large, you will always find the perfect one as per your requirement.